Welcome to the home of Quality Collision Repair online. We are a full service collision repair center in Pryor, Ok serving the entire Green Country area. We know that if you have been in an accident, or if you need to repair damage to your car or truck it can be stressful, time consuming, and frustrating. We do our best to take that away from you. We work quickly and accurately to get your vehicle out of the shop and back on the road. We will work with your insurance company for you and we are part of the Better Business Bureau so you know that Quality Collision is a name that you can trust. We have some of the best equipment out there and we have one of the best paint booths in Mayes County. We use dupont paint and we guarantee color match. Quality Collision Repair has been in business in Pryor, OK since 1996, and our Owner & Operator Kevin, has twenty years of experience in the industry. We have some of the best equipment out there and we have one of the best paint booths in Mayes County. We use dupont paint and we guarantee color match. 1. Do I have the right to select the repair shop? Yes. Select the shop of your choice and notify your insurance company of the claim. 2. Do I Need to Get Three Estimates? No. Notify your insurance company or agent. Your adjuster may inspect the damage. If possible, get a copy of the adjuster's estimate and take the vehicle to a shop of your choice. In some areas insurance companies can pay claims directly. If an insurance agent asks you to obtain two estimates, ask if they intend to pay your claim directly. If so, obtain two estimates as soon as possible. This will help you settle your claim. 3. Must I Notify My Insurance Company Before Repairs? Yes. Insurance policies require that you notify the company or your agent. You will be asked to make a report as well as make the damaged vehicle available for inspection. 4. What if your insurance company and the collision repair shop of your choice cannot agree on the cost to have your vehicle repaired? Most insurance policies provide for a damage appraisal. When the insurance company and the customer fail to agree, either party may demand a loss appraisal. This demand can be made within 60 days after the claim has been filed. Each party selects a competent and disinterested umpire and submits their findings to him. A majority decision between the umpire and the two appraisers settles the amount of the loss. 5.	Who Pays The Collision Repair Bill? You, the customer, must pay the collision repair shop. You may be reimbursed by insurance for this expense less any applicable deductibles or betterment allowances. If the agent is not responsible for paying your claim, contact your insurance adjuster. Generally claims are handled by the insurance company's claims department, not by individual agents. (avoid getting estimates from shops where you do not intend to get your vehicle repaired). 6.	Who Is Responsible For Completing The Repairs? The collision repair shop. Select a collision repair facility that is properly staffed with trained professionals and equipped to restore your automobile to its pre-accident condition. 7. What If There Is A Problem With The Repair? First, contact the manager of the collision repair shop. If the problem is still not resolved, you may wish to contact the Office of Consumer Protection. If the problem remains unresolved you may wish to contact your local Better Business Bureau or the District Attorney. You might also consider a small claims court action. 8. What If My Insurance Company Fails To Process My Claim Or Pay The Amount Agreed Upon? Contact your insurance agent. Then speak to the insurance company's regional claims manager. If that fails, contact the Oklahoma Department of Insurance Consumer Hotline 1-800-522-0071. 3. Some insurance companies may want you to visit their drive-in claims center before having your car repaired. You can do this, or you may leave your car at your collision repair shop and ask that the insurance company inspect the car there. 4. You are not required by law to obtain more than one estimate or appraisal. 6. Difference in repair estimates are common. A lower estimate may not include all necessary work. If you're not sure why one estimate is different from another you've received ask the shop manager. 7. Choose a shop that has uni-body repair equipment and certified (by I-CAR or ASE, for example) Technicians. 8. Ask the shop for references. 9. Ask if the shop offers a lifetime repair warranty. 10. Let the collision repair shop you choose help you negotiate your claim with the insurance company. Here at Quality Collision Repair we use the best equipment to make sure we make your vehicle as good as new. The versatile MAGNUM 360® CAGE is a true 3-dimensional, 360® system. Pull and lift from top and bottom as well as around the perimeter.This is the collision repair system that will handle every kind of vehicle from compact unibodies to full size vans and pickups.Overhead hoist moves smoothly side to side and end to end - making engine R & R, roof up-pulls, door hanging and many other tasks, quick and easy to perform. 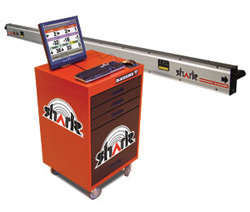 The Shark is a computerized electronic measuring system that relies on ultrasound technology for dramatic productivity improvements and the industry’s best speed and accuracy. The Shark provides live "measure-as-you-pull" functionality that virtually eliminates costly rework. We also use a Blowtherm paint booth. From hwy 69 turn west on 1st street (by Charlies Chicken) go across the railroad tracks and turn left (south) at the four way stop, we are the second building on the right next to Chouteau Lime.